Congratulations!!! And yum homemade pasta!! Don’t you love the “that’s wonderful” comment? I totally get the need to leave behind a conventional job and move into something aligned with your passion and sense of learning and growth. Rock on, Magnolia! Yes, absolutely. I’ve never been able to handle conventional for very long and the feeling was always mutual! Ahh yes but I’m lazy and overwhelmed and avoiding the things that need to be done by doing all the requirements of the award! Thanks! hahaha…somehow I feel better now – thanks! LOL I love the way you think!!! Thank you so much and welcome. So happy to meet you. Thank you, your words are very much appreciated. Counting down to October! Thank you so very much ~ I’m so hoonored! I love your blog as well ~ and I am so excited to hear about your new venture and non-profit! Good for you! I’ll be raising a glass to you on 12/10 for your special day! Fabulous and 50 should be a holiday! I just officially declared it and was laughed at! Kudos WWW sister! 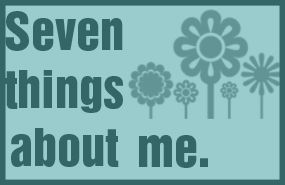 I love your responses to the 7 things. All of them. But I’d like to express a certain appreciation for one in particular. Turning 50. Can you give me a YEE HAW? Yes, you can, and sister, I will hold you to it. The year I turned 50 had NOTHING to do with the number…absofuckinglutely NOTHING to do with it. It may be coincidental, but that was the year I found my “FIERCE”…and I’m telling you…if you haven’t found it yet, you are not looking for it. Be prepared, 50 and 5ierce is WONDERFUL. Welcome to the club and YAY YOU! I totally understand. I am so excited for 50 and belonging to this club of fantastic over 50 women. I wouldn’t go backwards for anything and am proud of my age. I have no idea why anyone struggles with this. Absolutely. It’s like a whole new beginning, everything does looks different from here. I’m glad, but not surprised, you feel this way. Here’s to the 2nd half! I may need to bring two bottles of champagne! HAHA…well maybe one glass for them! Wow, what a great post, and what an awesome list!! You are funny, AND busy. Even a non-profit? How exciting. And I love the taste of homemade pasta but haven’t made it yet. Good on you! You have to try making pasta. I took a cooking class in Florence and was shocked to see how easy it is to make. Now I can’t eat dry pasta!